It's been awhile since I've discussed my proud membership in Gun Culture 2.0. This past week I spent three unforgettably informative days on the shooting range with Travis Haley and Ron Avery. On Monday's post, I will give you an in-depth account of how mind-blowing that event was. As part of a growing segment of America who have discovered a never-before-experienced passion and respect for gun ownership, it was probably the most significant time period I've ever spent. But you'll have to check back on Monday to find out why I feel this way. Today, I just want to talk to all the women who, like me, have been traversing this new universe of gun ownership, and often feeling tossed by the prevailing winds. If you are like me, you start off owning a larger frame firearm (such as a Glock 19, 9mm), because you were told it would be easier to manage. Or maybe, you are like others I have come across in my training, whose boyfriend, husband or father talked them into a .38 revolver for its simplicity. As I began shooting more, and becoming more proficient with my weapon, I felt comfortable enough to get my CHL license and seriously consider carrying a firearm for protection. But I know you will identify with the problem of how to actually conceal it. Those bigger framed guns just don't work for us women and how we dress. 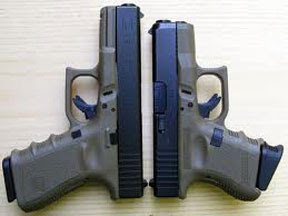 So I began to move from owning range guns, like the Glock 19 or 17, to Carry guns, like the Glock 26 and the M&P Shield. Consequence: It is harder for that bullet to stay on track out of a short barrel if you are shooting long distances; more difficulty in calling my shot and hitting where I want to on the target. Consequence: You can get a firmer grip when you have more real estate to hold on to. The larger guns offer a more substantial grip. Consequence: If the bad guys are shooting at you, how many bullets would you want at your disposal? Shooting larger capacity mags on the range gives me a better practice and training experience. Consequence: The tighter springs in the Carry guns make it much more difficult for a woman's hand to do a chamber check or lock the slide. I want to learn how to handle the gun quicker and more efficiently. Why make it harder on myself? Consequence: If the recoil is more severe in the carry gun, trigger reset and follow-up shots occur slower. The range gun delivers faster follow-up shots. So here's my new way of thinking: We women are an important new component of the gun culture. We are learning to defend ourselves and getting the proper training. Weapons manufacturers are catering to our needs with smaller guns that fit more comfortably in our hands and are easier to wear concealed. And, yes, that meets the concealed carry aspect of our needs. BUT, after these last few days, I have come to realize that a smaller gun DOES NOT meet my needs on the training range. The object of training is to acquire proficient skills through practice. Why would I want to handicap myself with a gun that is harder to manipulate, recoils more, and makes it more difficult for me to achieve my desired goal? The reality is that I'm paying serious money for 3 days of training, so I want a gun that will maximize my training. I don't want to suffer the stress of learning new gun handling skills while battling the stumbling blocks of a smaller carry gun. Why not take as many problems out of the equation as possible, so I can get the results I want? Does that mean that I will have less ability with my actual carry gun? No. Not if I transfer the knowledge I learned with the range gun to the smaller gun. This means time and dedication. Lesson learned: Range guns maximize training time; skills transfer to carry gun on my own time. There are different purposes for different guns. There are definite benefits to choosing the correct range gun, and this is just one of the lessons I learned this past week. Travis Haley and Ron Avery are intense dudes, and standing in 100 degree heat while receiving pearls of wisdom simply added to the sizzle. Tune in on Monday for the details! Luke 6:40 "The student is not above the teacher, but everyone who is fully trained will be like their teacher." sometimes toy gun is the reason of danger. we use the toy gun for having fun. but it's not great job. unfortunately you can fall in danger by using toy gun.